Welcome to Hotel Villa Florida Gardone Riviera. Hotel Villa Florida is a small Hotel with suites, rooms and elegant apartments with breathtaking views on the Lake Garda. The House is managed by the Cipani family, hoteliers since 1956. Embedded in the green of the nature reserve Parco Alto Garda the Hotel is surrounded by two hectars of olive groves which are still cultivated using traditional methods. Citrus fruits are another great passion in this area: lemons, mandarins, bitter oranges and grapefruits are all grown in small lemon groves made of stone an wood, just as in times gone by. The breathtaking views over Lake Garda are truly magical; the blue of the lake merges into the subtle green of the surrounding hills; the Garda Island, the Rock of Manerba and the pretty small towns on the other side of the lake. High above over to the east is the magnificent peak of Monte Baldo, which slopes gently down towards the lake and ends in the famous San Vigilio peninsula. 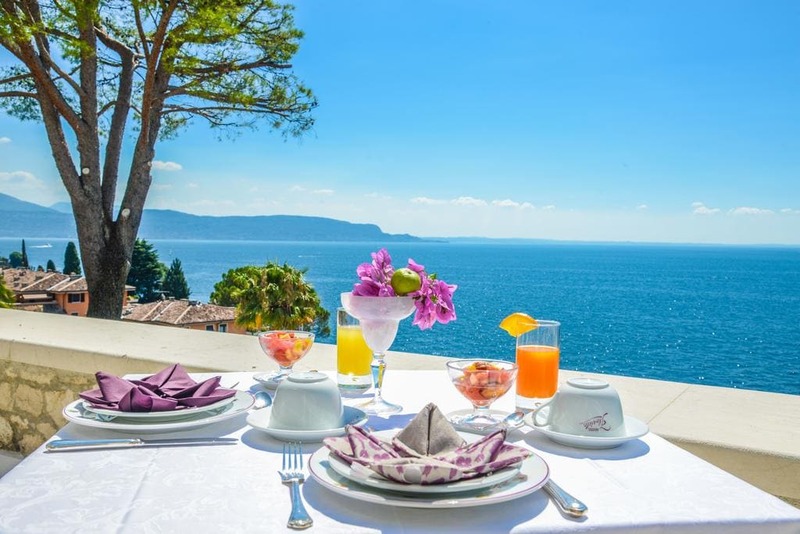 Set among oleanders, bougainvillea and colourful geraniums the elegant panoramic terrace called Il Belvedere dell'Angelo where the breakfast buffet is carefully prepared and served and where little events take place. Deeper in an olive grove you can find a fantastic panoramic swimming pool (27x9m) which invites you to relax, sunbathing or to play chess on a huge board. For those who enjoy good food, mild evenings can be spent sampling some delicious specialities in Gardone Riviera. We will recommend you some lovely romantic lakeside restaurant or cheerful trattorias hidden up in the hills among olive groves and vineyards, where fish and vine are specialities. A holiday in our small hotel means tradition, cordiality, relaxation and complete independence. (Hotel Villa Florida Gardone Riviera hotels).